The EU's economy is bouncing back, but additional investment efforts are needed to tackle persistent gaps between and within Member States. With a budget of €373 billion in commitments for 2021-2027, the future Cohesion Policy has the investment power to help bridge these gaps. Resources will continue to be geared towards regions that need to catch up with the rest of the EU the most. At the same time it will remain a strong, direct link between the EU and its regions and cities. Vice-President responsible for Jobs, Growth, Investment and Competitiveness, Jyrki Katainen, said: "Over the next decade, Cohesion Policy will help all regions modernise their industry and invest in innovation and the transition to a low-carbon, circular economy. In addition, our proposal will further contribute to a business-friendly environment in Europe, setting the right conditions for growth, job creation and investment." Commissioner for Regional policy Corina Creţu said: "Today we propose a Cohesion Policy for all regions, which leaves no one behind. We have made it more flexible, to adapt to new priorities and better protect our citizens. We also made the rules simpler and this will benefit all, from small businesses and entrepreneurs to schools and hospitals that will get easier access to the funds." In an unprecedented move of transparency, the European Commission has presented for the first time ever its proposal for the new long-term EU budget on 2 May both in current and in constant 2018 prices. 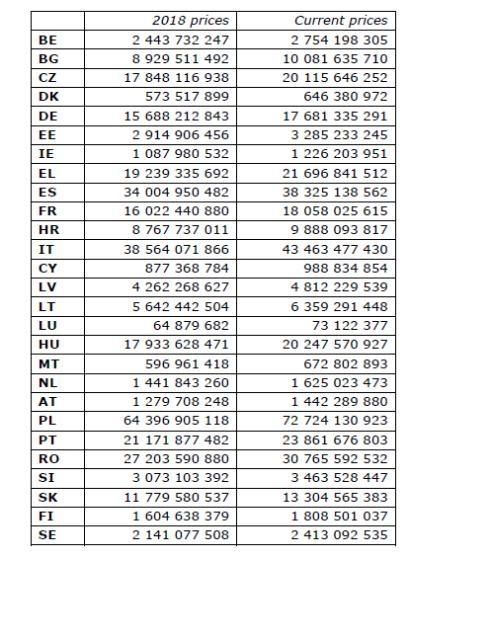 In the same vein, the Commission is also publishing today the national Cohesion Policy allocations for Member States both in current and constant 2018 prices (see annex). A swift agreement on the overall long-term EU budget and its sectoral proposals is essential to ensure that EU funds start delivering results on the ground as soon as possible. Delays similar to the ones experienced at the beginning of the current 2014-2020 budgetary period would mean that 100,000 EU-funded projects could not start on time; that many schools in need of renovation works would have to wait; that medical equipment would be delivered to hospitals late or that small businesses would have to plan investments without the necessary certainty. The Commission has provided unprecedented transparency by presenting for the first time ever its proposal for the new long-term EU budget on 2 May both in current and in constant 2018 prices. In the same vein, the Commission is also publishing all relevant figures for the various spending programmes both in current and constant 2018 prices. Current prices – taking inflation into account.